Hassanpour Avanji, S., Paknejad, F., Shojaei Poor, M., Esfandiari, M. (2014). The Survey of Ending Season Drought Stress Impact and Different Planting Dates on Grain Yield and Gaining Weigh T Rate and Wheat Filling Period Characteristics in New Bread Wheat Genotypes. International Journal of Advanced Biological and Biomedical Research, 2(1), 253-260. S.R. Hassanpour Avanji; Farzad Paknejad; M. Shojaei Poor; Mehrdad Esfandiari. "The Survey of Ending Season Drought Stress Impact and Different Planting Dates on Grain Yield and Gaining Weigh T Rate and Wheat Filling Period Characteristics in New Bread Wheat Genotypes". 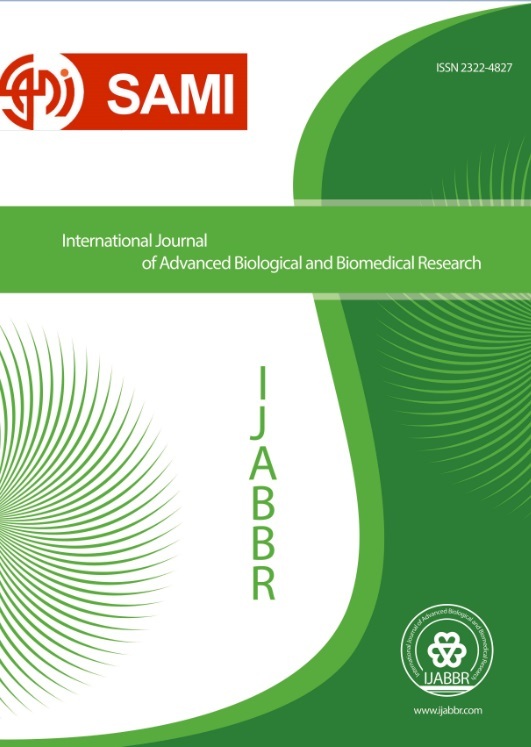 International Journal of Advanced Biological and Biomedical Research, 2, 1, 2014, 253-260. Hassanpour Avanji, S., Paknejad, F., Shojaei Poor, M., Esfandiari, M. (2014). 'The Survey of Ending Season Drought Stress Impact and Different Planting Dates on Grain Yield and Gaining Weigh T Rate and Wheat Filling Period Characteristics in New Bread Wheat Genotypes', International Journal of Advanced Biological and Biomedical Research, 2(1), pp. 253-260. Hassanpour Avanji, S., Paknejad, F., Shojaei Poor, M., Esfandiari, M. The Survey of Ending Season Drought Stress Impact and Different Planting Dates on Grain Yield and Gaining Weigh T Rate and Wheat Filling Period Characteristics in New Bread Wheat Genotypes. International Journal of Advanced Biological and Biomedical Research, 2014; 2(1): 253-260. In order to study planting date impacts and ending season drought stress on grain yield and gaining weight rate and wheat filling period characteristics in new advanced bread wheat genotypes ,this research is done by using plan statistical of spilt plot in form of complete random blocks basic plot with 3 replications in both common separated irrigation and ending season drought stress tests (stop irrigating in50% pollination phase ) in research institute field for breeding and providing seeds and seedling in Karaj in 387-1388. Planting date factor is studied in 2levels mehr 20th and aban10th in main plots and 4 genotypes resisting to bread wheat drought stress including c-85-D7;c-85-D8; c-85-D9; c-85D13 with Alvand check value in minor plots in both tests. the results of variance analysis for measured characteristics in both common irrigation and drought stress tests show that impacts of planting dates ,Genotypes and planting date interaction multiplied by genotype on grain yield characteristics ,rate gaining weight and wheat filling period (in both tests) were meaningful at 1% level. According to results of test average comparisons in both common irrigation condition and drought stress , showed that c-85-D9 in both conditions having most wheat filling speed and c-85-DB having most wheat filling period and meanwhile both genotypes had rather good grain yield in both conditions . recent results have showed that different wheat genotypes have interaction with environmental conditions so that each genotype using its own special strategies for resisting to stress.